I have a high CQ. This often gets me into some interesting situations. Here is one incident that has zapped me. Some four months ago, I read a book review in one of the monthly magazines that I subscribe to. I liked the review and ordered for the book from Amazon. I was also intrigued by the name of the reviewer. This particular magazine carries the email address of all contributors and so I sent an email to the reviewer asking him the etymology for his very unusual name. For the purpose of this post, let us call him SAJ. I received a prompt reply from him explaining the name, which is a name of deity of a temple in Tamil Nadu very close to my roots. That exchange led to further mails with both of us getting to know each other better. We found many things of common interest and knowledge. He was at that time staying with one of his sons in the USA and we also spoke to each other on the telephone a few times. He returned to India and his home in Chennai earlier this month and we continued to exchange emails and also spoke to each other on the landline a couple of times. Last week, I thought that it would be a better idea to exchange some communication via mobile cellphone and in an email asked for his Indian cellphone number while sending him mine too. I received a call a few hours later on my land line from SAJ and he threw me for a loop. He said that he does not have a cellphone and does not intend to get one either. He says that he is very comfortable without one and actually pities people who are tied to them! I told him that I admired him for his stand and reaffirmed that we will indeed continue to use the landline and emails to communicate with each other. He is the only one that I am now in regular touch with who does not have a cellphone! Bravo! Will I be able to gather enough courage to ditch my cellphone and go back to the more relaxed days of landline telephony only? I am giving serious consideration to the possibility. This entry was posted in Books / Reading, Friendship, Relationships and tagged Chennai, CQ, Etymology. Bookmark the permalink. 12 Responses to A Unique Personality! Good story in the run-up. Yours truly doesn’t have a cell phone either. Landline it is. Which isn’t as “passive-aggressive” (to use Jean’s lingo) as it sounds since I work from home so am largely available round the clock. Mind you, and my heart bleeds for those who try, no text messages can be received. TALK TO ME, I say to the aggrieved. Send me an email you lazy bastards if you can’t be arsed to pick up the phone. Mind you, it’s not all laughs on my side. Those without cell phones are now discriminated against. Last week alone I came across four different companies and their websites which DEMAND your cellphone number (indicated by that little red star = “required”) to do business with them, and if you don’t have one, well, tough luck to me and good bye. Yes, sod you too, I think to myself. Do I look like someone who lets herself be coerced? I tell you, Ramana, if there is one thing in this life which has potential to do my head in it’s communication. The other day I merrily hung onto the phone WAITING (for forty five minutes) to speak to a PERSON as none of their “options” covered my query. Mind you, I have wizened up since then. Just press any old button and someone will be with you – about forty four minutes later and with an incomprehensible accent (not their fault). I live in a world I sometimes don’t recognize any longer. You never fail to surprise me! So, SAJ is not the only one of my acquaintances sans a cellphone. Amazing! 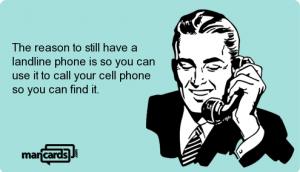 my original need for a cellphone – was security when out and about – or when I was running late for VIP meeting… it was like a security blanket. Then phones didn’t do much, you could text and phone…NOW it’s different, you can do just as much and maybe more than the bulky laptop or other. i do still have a landline, a couple of people on my radar do not have a cellphone, my elderly sister doesn’t even have an answering machine on her landline; and I’ve another friend who has similar to big-sis. Your comments reflect my experience too. I am glad that you commented on the curiosity part. No one else did so far! As I think you know, I do have a cellphone but a very basic one for phone calls and texts only. I hardly ever use it as I only keep it with me for possible emergencies like a car breakdown or an injury while I’m out walking. Most people have my landline number, which is what I usually use. I really wish that I could go back to those simple gadgets and times! I am now stuck with whatsapp which won’t leave me even if I want to leave it. As for the curiosity angle, I wouldn’t go to the lengths of asking someone I’ve never met about their unusual name. I would just wonder about it and then move on. But if it was someone I was physically talking to, I might very well ask them about it. Interesting how it has led to a lasting friendship! I normally won’t either. It is only after I failed to find anything on the net that I wrote to him. I have only had a land line for a couple of years now. and there is no message system on it. I bought it for $15 dollars and it works just fine. if I’m here I answer it and if I’m not here it doesn’t get answered. even when I had a cell phone I never used it. I would forget to charge it. it was a waste of money each month! I don’t feel left out I feel unshackled! I’m taking a computer break from commenting for awhile to enjoy my favorite season of the year. see you on the other side! Lucky you. Enjoy yourself and I will wait. Don’t give up your cell phone, Rummuser! Businesses and government agencies are busily setting things up so that you will need it to access just about anything! Everything needs to be ‘mobile friendly’ now—and that includes our blogs! In updating my blog while I was on my break, my tech person tested it out on his cell phone (on which he can get Google—which I haven’t set up on mine) and informed me that my blog did not look great on mobiles. The information on the right side of the blog (archives, featured posts, etc.) was too small to see, and the header didn’t extend over the entire top of the blog. I’ll do this another time, but it was a bit upsetting to know, since it appears that a great percentage of readers access articles on iphones! My bank keeps requesting me to go to what they call mobile banking but, I have resisted so far. My son and daughter in love however have switched and say that they find it very convenient. No, I won’t be giving up my cell phone any time soon as I have other uses for it like google searches for words, things, alram clock, etc.